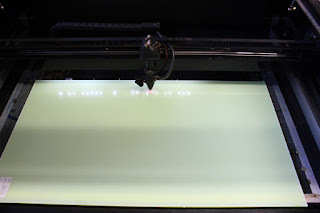 There was a single row of leds mounted under the gantry on my laser cutter, over the years the LED's have slowly stopped working and they were in a bit of a sorry state. I'm going to be installing a new camera into my laser cutter at some point and lighting is always important so it was a good time for an upgrade. Instead of one strip of light that moves and creates ever changing lighting I thought it would be better to put two static strips one the Y rails. I pulled the LED strip off the bottom of the gantry, it was pretty badly stained from years of laser cutting. The new lights are weatherproof, silicone coated so they should stay cleaner and functional for a lot longer. They are wired into the existing switch so they can be turned on and off from the outside of the machine.